A TREE at 9th St. and Hudson barely missed the house. The Hancock Park area is a lovely place to live: homes built in the 1920s, ornamental streetlights in the parkways, and mature trees that have grown and flourished for over 80 years. Unfortunately, for many of those trees, their days may be coming to an end. The combination of disease, age and weather has contributed to the common occurrence of trees coming down hard and unexpectedly. Most recently, the neighborhood lost at least three large, mature trees during the rainstorms, along with many smaller trees and branches. 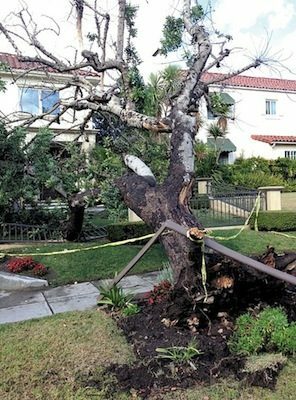 A California sycamore on the 500 block of N. Cahuenga Blvd., which had been inspected as recently as November 2014, was felled along with a parkway tree at 9th and Hudson that came crashing into the homeowners’ yard, barely missing the house. 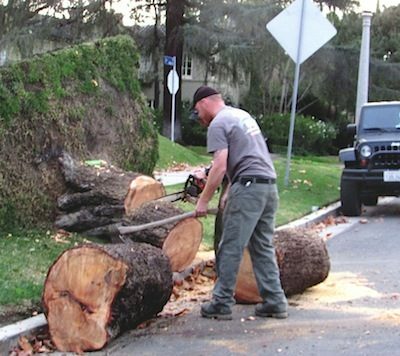 Although the city of Los Angeles tries to remove a fallen tree within two days, sometimes the city gets backlogged and the removal takes longer. In the case of the Lorraine tree, which was completely blocking 2nd St., a few neighbors pitched in to help. An off-duty fireman, who happened to have a chainsaw in his truck, along with a family passing through in their car, who also happened to have a chainsaw in their car, plus a neighbor from Wilton and 2nd St. all stepped in, clearing the tree. “The tree was cleared by three good Samaritans who simply took the initiative,” wrote homeowner Dena Bloom. PINE TREE uprooted on Lorraine was cleared by trio of chainsaw-equipped Good Samaritans. The city of Los Angeles does not water parkway trees, so it is up to the homeowners to tend to the trees that grow between the sidewalk and the street. Elena Stern, senior public information director, Dept. of Public Works, advised the Chronicle through email about the correct way to water parkway trees during the drought. Many properties use irrigation systems that are not efficient for slow, deep watering, so Stern recommends to water deeply manually with a soaker hose or a slow hose drip. Stern points out that many people are linking drought to tree failure, but says that the Public Works Department is not familiar with any research that validates that. However, drought could hasten a diseased tree’s demise. If you experience a downed tree in your neighborhood, go online to bss.lacity.org or call 311. The emergency response is two workdays or less.